William De Brahm’s tenure in South Carolina was as dramatic as it was brief. Within a period of five years between 1752 and 1757 he drafted several different audaciously sophisticated plans for fortifying urban Charleston, charmed the doubting General Assembly, and ultimately roused the contempt of most of his supporters. Along the way he left a paper trail that provides fascinating insight into the most intensive period of fortification construction in pre-Revolutionary Charleston. The German-born De Brahm initially came to British North America to work as a surveyor for the colony of Georgia, but South Carolina’s governor, James Glen, lured him to move to Charleston with promises of a lucrative contract to design and build fortifications for the port town. Although Governor Glen’s scheme was initially rebuked by the South Carolina legislature, the outbreak of fresh hostilities Between Britain and France—what we now call the French and Indian War—convinced our politicians of the urgent need to repair and expand Charleston’s aging fortifications. De Brahm’s designs for fortifying Charleston survive among archival collections at the National Archive of the United Kingdom and at the British Library. 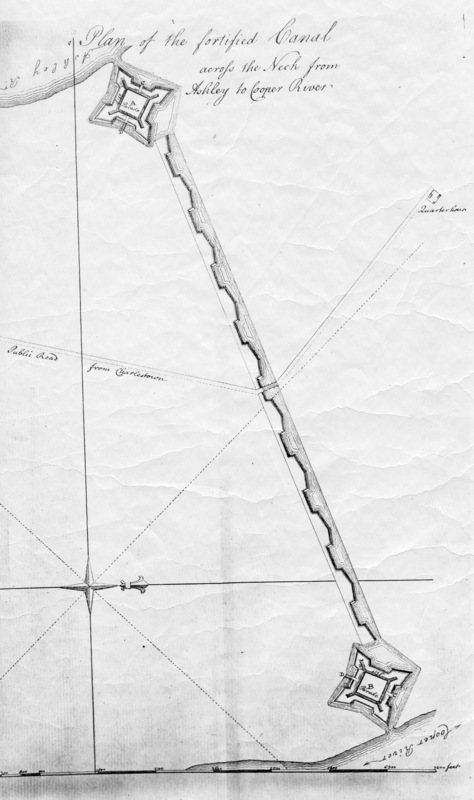 A total of six drawings survive, illustrating De Brahm’s proposed defensive works for urban Charleston, Fort Johnson on James Island, and a “Fortified Canal across the Neck from Ashley to Cooper River.” From these documents we see not only De Brahm’s considerable skill as a draftsman, but also the depth of his training and understanding of the science of military architecture. Encouraged by Governor Glen and finally approved by the General Assembly, De Brahm commenced work in 1755 to transform the peninsula of Charleston into the most sophisticated military enceinte in British North America. If he had completed this project, Charleston would have become an island, separated from “the neck” of the peninsula by a fortified canal flanked by two small forts. But De Brahm’s work dragged on at a snail’s pace while the war with France move increasingly northward. By 1757 it was clear that the Canadian frontier was the epicenter of the war, and the perceived need for coastal defenses in South Carolina diminished. De Brahm’s elaborate new works for Charleston were already behind schedule and over budget, and in 1757 he learned that his services were no longer needed in South Carolina. Fortunately for us, De Brahm left a robust paper trail of his activities in South Carolina. Many (but not all) of the drawings he made in Charleston survive in British archives, and in 1773 De Brahm presented an illustrated summary of his work in South Carolina and elsewhere to his ultimate employer, King George III. From these records, combined with accounts and descriptions in the surviving legislative records of colonial South Carolina, we can learn much about the ambitious efforts to expand Charleston’s fortifications in the 1750s. This era forms one of the most fascinating and well-documented chapters in the fortification history of urban Charleston, and the projects set in motion by De Brahm had long-lasting ramifications for the growth of the city’s built environment. Time: Wednesday, September 24th 2014 at 6:00 p.m.